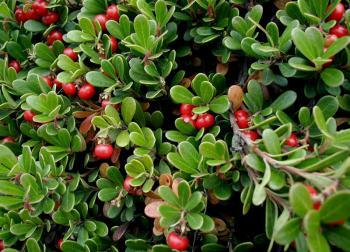 Identification: Kinnikinnik is a common trailing evergreen shrub, with brownish-red stems that can reach 20cm in length . The shoots spread quickly and will form thick, dense mats along the ground . The leaves are oval shaped, 2-4cm long, leathery, dark-green and alternate on the stems . The flowers are “urn”-shaped, small, pinkish-white, which droop in clusters off of the branches. The flowers bloom from May to July, depending where you are in Canada . The berries are bright red, look like miniature apples, and ripen in late summer to fall persisting into early winter . The berries are edible however are dry and mealy with large seeds, usually only eaten as a survival food . Cautions: Concoctions made from kinnikinnick should not be ingested while pregnant, or if the user has gastrointestinal diseases as it can irritate the stomach. Excessive and prolonged use should also be avoided . Current Distribution and Local Habitat(s): Kinnikinnick is found in sandy and well-drained sites, dry rocky slopes, and exposed sites . Kinnikinnik is mostly shade intolerant, so often can be found in open forest clearings, shorelines, ridges, sand dunes, and hilltops . It is common and widespread across North America, from Northern California to Alaska and across Canada found in all provinces and territories. Its range extends south in the Rocky Mountains down to New Mexico . Kinnikinnik roughly translates to “smoking mixture” in Algonquin, which is known to be kinnikinnik's most common use . The leaves were dried and smoked by several coastal First Nations groups, including the Coast Salish, Nuu-chah-nulth, Haida, Nuxalk, Tsimshian, Kwakwaka’wakw, and other mainland groups . A decoction made from the leaves can be used to treat a wide variety of ailments, including bladder and urinary tract infections, kidney problems, and to ease menstrual cramps . Kinnikinnik is a known diuretic, and has anti-bacterial, anti-inflammatory properties . Other traditional uses include using the dried crushed leaves as a poultice to treat wounds, or as a decoction to wash wounds . 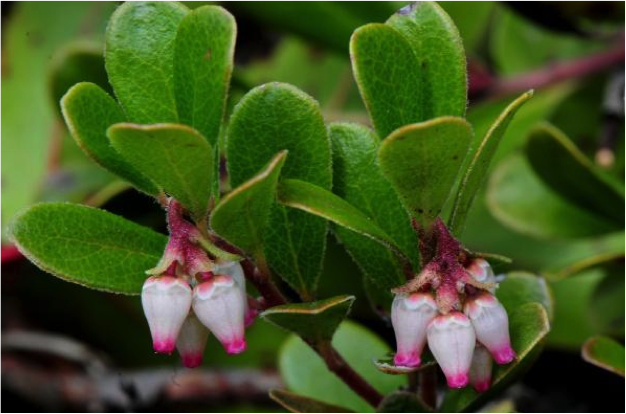 Several First Nations groups ate the berries, despite their flavourless, mealy texture . The berries would usually be soaked in water, grease, seal oil, or butter to reduce their dryness and prevent constipation . UVic Campus Location(s): Kinnikinnick can be found in the different wooded areas around campus, in drier open sites. Notable sites include the native plant garden around the First Peoples house, as well as surrounding the Clerihue building. Crane, M. F. 1991. 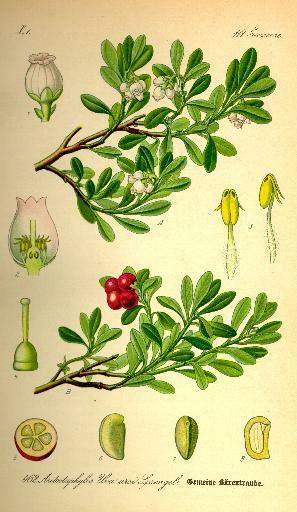 Arctostaphylos uva-ursi. In: Fire Effects Information System, [Online]. U.S. Department of Agriculture, Forest Service, Rocky Mountain Research Station,Fire Sciences Laboratory (Producer). Retrieved from: http://www.fs.fed.us/database/feis/plants/shrub/arcuva/all.html [2017, November 25]. MacKinnon, A., Pojar, J., & Alaback, P. B. (2004). Plants of the Pacific Northwest coast. Lone Pine Pub. Ritch-Krc, E. M., Thomas, S., Turner, N. J., & Towers, G. H. N. (1996). Carrier herbal medicine: traditional and contemporary plant use. Journal of Ethnopharmacology, 52(2), 85-94.